Trying to figure out nutrients when growing cannabis for the first time can be confusing. With multiple nutrient companies offering a variety of nutrients for different purposes, one must remember that the most important thing is to give your plants the right amounts of nutrients at the right times. There are two main life stages for the cannabis plant, vegetative and flowering, and each stage has different nutrient requirements. NPK stands for Nitrogen, Phosphorus & Potassium as per the periodic table. Different Ratios of NPK are required for the two main life stages of the cannabis plant. Vegetative stage requires high nitrogen, medium phosphorus and high potassium. So adding a“Vegetative”(high nitrogen) or“general purpose”nutrient formula for the first stage of life is recommended once your plant opens its first leaves. If you use high-quality soil you can skip vegetative nutrients for the first three to four weeks while your plant uses up the nutrients in the soil. For the flowering stage, as soon as you start to see buds forming, you want to start using low nitrogen nutrient formula with plenty of phosphorus and potassium, which are crucial for bud development. Phosphorus increases the number of flowers, while potassium helps increase the bulk of the flowers. Take caution though, because going overboard with either can burn your plants. Mainly you want to avoid giving too much nitrogen in the flowering stage as it discourages bud development and can add an unpleasant taste to the buds. The most common reason for getting nutrient deficiency is because the pH is too high or too low. Even if the right amount of nutrients are present the plant is unable to absorb the nutrients if the pH levels aren’t in the correct range. When it comes to whether using organic or chemical nutrients, it’s not a question of which is better, as both are good at doing different things, but often can come down to the setup you have and how you intend to grow. For instance hydroponic systems tend to work better with chemical nutrients, as organic matter can cause unwanted stuff to grow in your water reservoir. Better Smell & Taste to Buds – Many growers believe organic-based nutrient systems create the most fragrant and “smoothest” buds. Some of the best benefits to smell and taste seem to come from using composted soil that’s been amended with nutrients from natural sources. This creates a living soil with colonies of beneficial microorganisms and is often associated with a bolder taste and smell in buds. However, watering your plants with liquid nutrients that just happen to be organic will likely not get the same level of results. Increased Potency – While organic nutrients may increase the smell and taste of buds, chemical nutrients may increase the potency. Faster Growth– Chemical nutrients provide nutrients to plants in the most easy-to-absorb forms possible. This results in somewhat faster growth than if the nutrients have to be broken down in the soil by a colony of microorganisms before they become available to your plant. Only Choice for Hydro–These are the best cannabis nutrients for hydroponic systems because they are less likely to cause stuff to grow in the water reservoir. However, chemical nutrients can also be a great choice for soil or coco because of the increased potency and faster growth! Don’t want to use nutrients at all? Learn how to compost your own super soil, or buy super soil pre-made online! Super soil compost contains all the nutrients your plant will need from seed to harvest so you just need to add water, and as an added bonus, with composted super soil you don’t need to worry about maintaining your pH! Instead, the composting process develops a colony of microorganisms in your soil that will automatically take care of the pH for your plants (like in nature), while slowly providing nutrients on demand. Ingredients – there are many different combinations of chemical and organic compounds that can add up to same nutrient ratios, and each compound reacts differently with each other. This means you can see two nutrient bottles with the exact same NPK ratios on the bottle, but each will actually provide somewhat different levels of nutrients to your plants. Soil or Hydro – it’s really important to match your growing medium with your nutrients. “Soil” nutrients are different from “Hydroponic” nutrients so make sure you’re getting the right kind! Coco coir is generally considered a type of hydroponics when it comes to nutrients, and there are also nutrients specifically designed for coco coir. Don’t confuse supplements for nutrients.If the NPK ratios are really low (like 0.2-0.2-0.1) it means that this product is some type of supplement, not a base nutrient. As long as you provide the right NPK and micronutrients by using base nutrients, you are already giving your plant everything it needs to grow. Supplements can be nice, but sometimes going overboard with supplements can cause unwanted reactions between nutrients or possibly burn your plant. Just to be safe, for your first grow only use supplements from the same company as your base nutrients (to minimize reactions), and try to pick just the one or two supplements that appeal to you the most (to minimize the chance of burn by going overboard). Here are several examples of trustworthy nutrient brands that work well for growing cannabis. These nutrients have been extensively tested by growers and are known to produce great results! GH Flora trio works well for growing cannabis. Although it can be used in soil, it does best in coco coir and especially full hydroponic applications. General Organics nutrients are made by the same people as General Hydroponics, except these nutrients are organic and formulated specifically for soil. For Soil “Grow Big” & “Tiger Bloom” provide most of the major nutrients your cannabis needs, while “Big Bloom” has many micronutrients and beneficial compounds that help nutrient uptake and root health. This trio works extremely well by itself, just follow the feeding schedule (here’s a PDF, here’s a JPG) from Fox Farms. For Cocoa and Hydro setups, Fox Farm has a “hydro” nutrients version. Two bottles are the same as the soil trio, but the “Grow Big” bottle is formulated slightly different for a soilless grow. 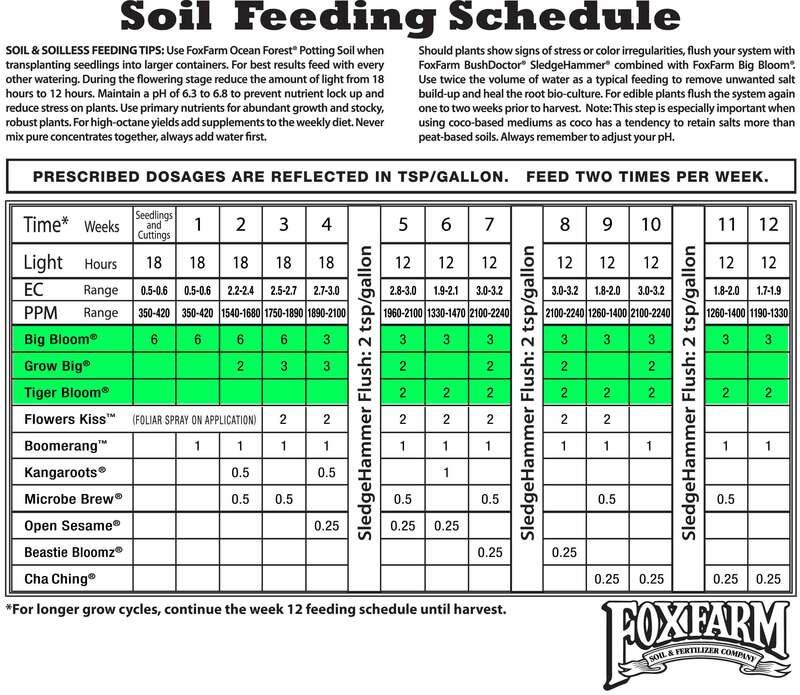 Follow the feeding schedule (here’s a PDF, here’s a JPG) from Fox Farms. Generally, the Fox Farms nutrient system will prevent Cal-Mag deficiencies, but it’s good to have extra Cal-Mag on hand just in case whenever growing cannabis in coco coir. The ‘Base’, ‘Grow’ and ‘Bloom’ nutrients from Botanicare ‘KIND’ series are all that’s needed to get your plants successfully to harvest time. 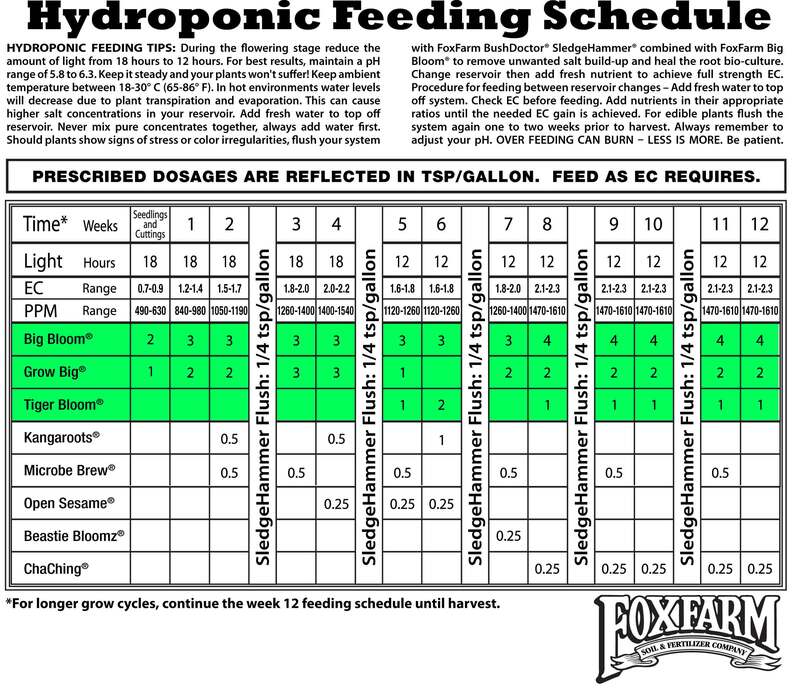 Just follow the feeding schedule from Botanicare [PDF], starting at half the recommended strength. This series is recommended by many hydroponic growers and is accompanied by very high ratings. From planting a seed to picking the first produce, Biobizz are leaders in their field when it comes to eco-friendly crop cultivation. Because the products are completely organic they are best suited for growing in soil. ‘Bio Grow’ is a liquid fertilizer that can be applied to most types of soil and substrate mixtures and is perfect for the vegetative stage of growth. ‘Bio Bloom’ is a complete liquid organic fertilizer, which contains the perfect blend of nitrogen, phosphorous, and potassium to ensure a platform for exuberant flowers and tasty buds. Learn how to germinate cannabis seeds.